I am doing my DPhil in Biomedical Imaging (EPSRC and MRC Centre for Doctoral Training (CDT)). My DPhil research focusses on detecting structural anomalies occurring in the brain white matter, thus assisting in the diagnosis of various neurodegenerative diseases. These anomalies include white matter hyperintensities (WMH, also called white matter lesions), cerebral microbleeds (CMBs), lacunar infracts and perivascular spaces. I did my Master of Science by research in Indian Institute of Technology Madras in Electrical Engineering, specializing in retinal image analysis. 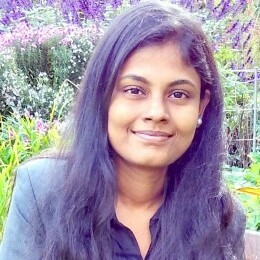 My Masters’ research was focused on identification of various retinal diseases including diabetic retinopathy and age-related macular degeneration in retinal color fundus images, using image computing techniques and machine learning algorithms. Oxford India Centre for Sustainable Development (OICSD), I believe, provides an excellent avenue for understanding and developing interdisciplinary research, which is one of the main objectives of CDT as well. Through OICSD, I hope to understand the impact of various other disciplines on healthcare, which I think would be helpful in achieving my long-term goal of promoting sustainable healthcare delivery in rural India through academic research and industrial collaboration. Moreover, I hope to improve my social connectivity and management skills by organizing OICSD seminar meetings and conference. Griffanti, Ludovica, Giovanna Zamboni, Aamira Khan, Linxin Li, Guendalina Bonifacio, Vaanathi Sundaresan, Ursula G. Schulz et al. “BIANCA (Brain Intensity AbNormality Classification Algorithm): A new tool for automated segmentation of white matter hyperintensities.” Neuroimage 141 (2016): 191-205. Sundaresan, Vaanathi, Christopher P. Bridge, Christos Ioannou, and J. Alison Noble. “Automated characterization of the fetal heart in ultrasound images using fully convolutional neural networks.” In Biomedical Imaging (ISBI 2017), 2017 IEEE 14th International Symposium on, pp. 671-674. IEEE, 2017. “Automated characterization of the fetal heart in ultrasound images using fully convolutional neural networks” – 2017 IEEE 14th International Symposium on Biomedical Imaging (ISBI 2017), Melbourne. “Modelling white matter hyperintensities distribution within a population using Bayesian Inference.” – Annual meeting of Organization for Human Brain Mapping (OHBM), 2017, Vancouver. “Improvements in the white matter hyperintensities detection algorithm.” – Medical Sciences Day, Nuffield Department of Clinical Neurosciences, University of Oxford, UK. “White matter hyperintensities distribution modelling with respect to ageing” – Biomedical Imaging festival 2017, University of Oxford, UK. Local Intensity Guided Spatially Adaptive Thresholding of White Matter Lesion Probabilities – OHBM 2018, Singapore. Identifying Subjects with Cerebral Microbleeds in Big Datasets: a Pipeline for Candidate Selection – OHBM 2019, Rome. My research project focusses on detecting small vessel disease signs such as white matter hyperintensities (WMH), Cerebral microbleeds, lacunar infarcts and perivascular spaces in the brain MRI images. The first aim is to model the probabilistic distribution of WMH related to ageing and dementia in MRI images, across different populations with memory deficits (OPTIMA), vascular risk (OXVASC) and typical ageing (Whitehall). Such a model can then be used in the discrimination of different disease subtypes (e.g., vascular dementia vs normal) which would be very valuable from a clinical perspective, especially in cases where the early symptoms are similar but treatments should only be administered in certain cases and may be detrimental for others. The second aim is to pursue more fundamental methodological work in the segmentation of lesions, WMH, stroke infarcts and more diverse pathologies in the brain using a combination of supervised and unsupervised machine-learning methods. Although many publications exist in the realm of lesion segmentation, very few tools are publicly available and their performance is still limited in many ways. Additionally, my work addresses the growing need for flexible segmentation tools like this to work with large, wide-ranging imaging databases such as the UK Biobank. Gurantors of Brain travel grant for Annual meeting of Organization for Human Brain Mapping (OHBM) 2017, Vancouver. Participated and presented my work in Translation Neuroimaging group retreat day in London. Participated in the online student outreach event “I’m an engineer: get me out of here!” which is a discussion forum between school students and engineers, that took place for two weeks from 8th November to 18th November, 2016. The event involved answering the students’ questions and having a live chat with students from different school zones. Serving as an expert scientific mentor in Karta Initiative widening access program.